It’s the Fall of the House of Gotti. The late mob boss John Gotti must be spinning in his grave after NYPD cops raided his iconic home in Howard Beach early Thursday to arrest his namesake grandson on drug charges. The raid marked the first time ever that members of law enforcement crossed the Gotti threshold armed with a search warrant. “They destroyed the house,” claimed Gerard Marrone, the lawyer representing John Gotti, the grandson. His father is mob scion Peter Gotti. 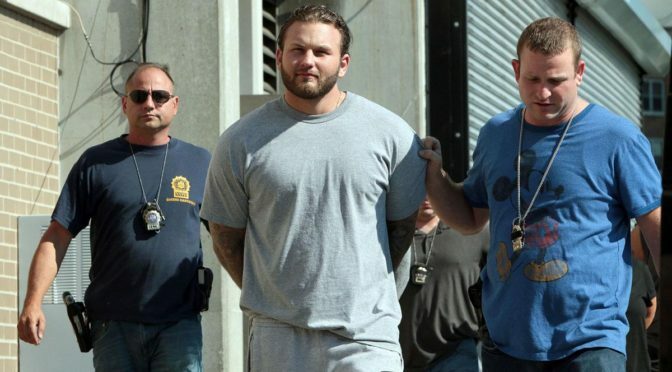 Detectives seized $40,000 and 500 Oxycodone pills inside a safe in Gotti’s bedroom where he was shacked up with girlfriend Eleonor Gabrielli, who was also busted, officials said. Retired FBI supervisor Phil Scala said the 23-year-old grandson’s reckless behavior in the House of Gotti violated a sacred rule. The Dapper Don never conducted mob business in his home because he wanted to protect his family from exposure to his criminal activities, according to Scala, who headed the Bureau’s Gambino squad for years. “If John was still alive he would be spewing every pejorative he could, knowing that somebody did something so stupid to besmirch his home and his family,” Scala told the Daily News. Queens District Attorney Richard Brown said Gotti and a crew of dope dealers were peddling Oxycodone pills on the streets of Howard Beach and Ozone Park for $23 to $24 per painkiller pill. Gotti was recorded on a wiretap stating that he sold more than 4,200 pills a month and the illicit business pulled in $100,000 a month. Undercover cops allegedly made 11 buys from Gotti, purchasing $46,000 worth of Oxycodone from him. He faces up to 25 years in prison if convicted. Investigators also executed a search warrant at the Rebel Ink Tattoo Parlor where Gotti is a part-owner. He also said the elder Gotti never brought business home. The bedroom of Gotti’s son Frankie, who was killed in a tragic car accident, was maintained as a shrine in the house, Kasman said. Also charged are Shaine Hack, 37, Edward Holohan, 50, Steve Kruger, 57, Justin Testa, 41, Michael Farduchi, 24, Melissa Erul, 23, and Dawn Biers, 46. Investigators seized $200,000 from Hack’s home in Howard Beach — allegedly drug proceeds he was holding for Gotti. The feds never sought a search warrant for the home in the past although there were unproven suspicions the “Gotti legacy,” — a massive stash of cash reaped from Gambino family rackets — was possibly hidden somewhere inside, Scala said.